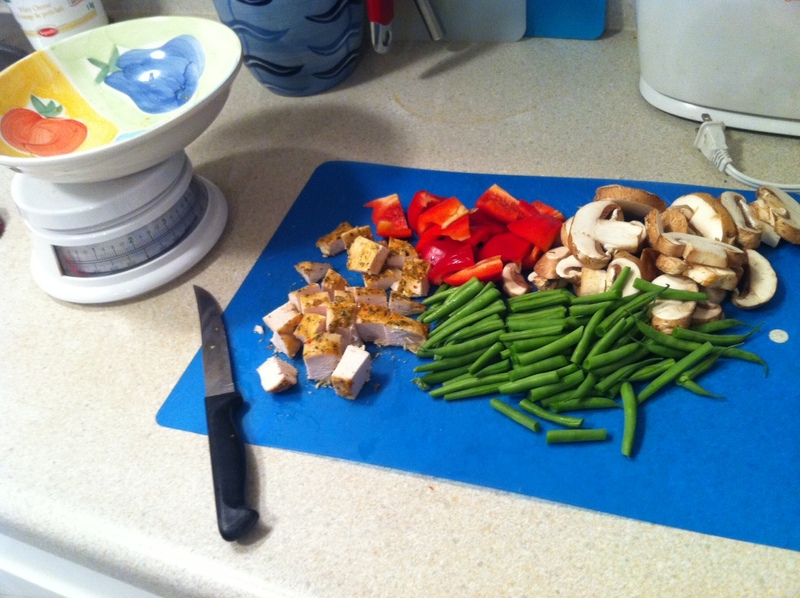 You are here: Home / Blog / Five Ingredients or Less – Stir Fry ‘O Rama! 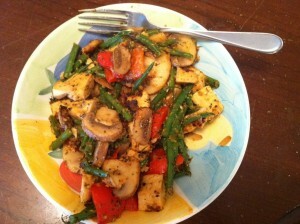 Five Ingredients or Less – Stir Fry ‘O Rama! The gauntlet has been thrown down. Fitness Blog World has challenged us to come up with a clean and healthy recipe with 5 ingredients or less. I added in another modifier – EASY. Yup, I like to make my recipes fast and easy. The less time spent in the kitchen means the less likely I am going to find myself shoving a spoon into my husband’s peanut butter for ‘quality control‘ purposes. Sometimes you have to test that darned peanut butter 5 or 6 times just to be sure. I like to be sure. Easiest recipe on the planet. 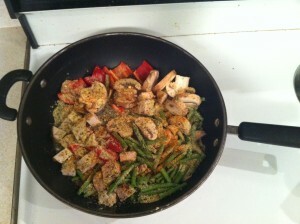 Chicken and vegetables with a little ‘o rama thrown in for good measure. Technically more than FIVE ingredients unless you call all the spices 'seasoning'. Let's do that, shall we? I actually bake 5 or 6 chicken breasts ahead of time in the oven at 350 degrees for 45 minutes so they are ready to be eaten at any given moment. Grab whatever veggies you have and you’re nearly finished. Then get your chop on. I can handle this kind of chopping, quick and easy. WIN! Throw it all into a wok with a cup of water on medium heat. Now time for the ‘o rama. Add more spices than you would think reasonable. 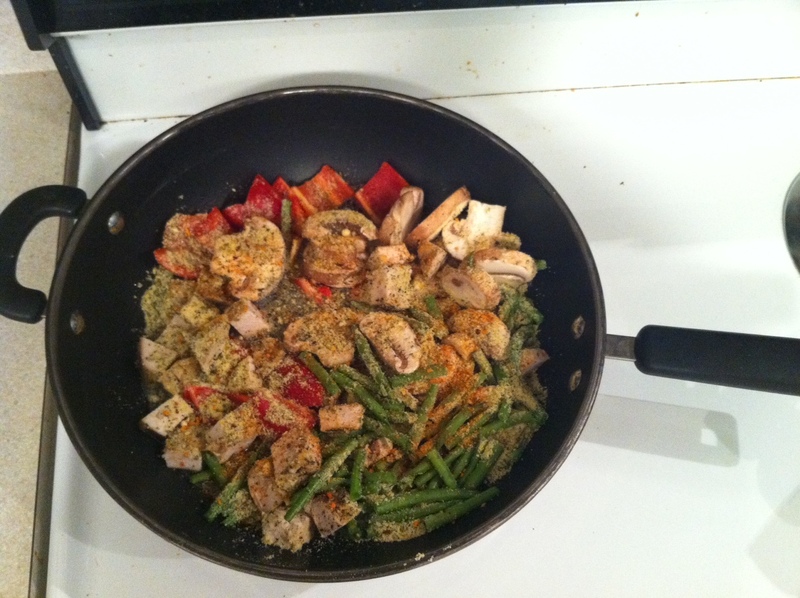 I abused the Club House parmesan flavored seasoning and used more Mrs. Dash than a normal person would ever think about adding. Cook until veggies are tender and and the water is gone. For even more o’rama, burn it just a wee bit. Just a wee bit crispy! 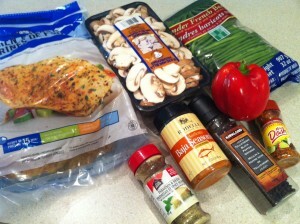 I love it, but if you’re not used to ‘o rama-ing your stir fry, I suggest starting out slow with the seasoning. Like my mom always said, ‘Its easy to add more!‘ Moms are smart. What’s your favorite 5 ingredient or less recipe? I make stir fry almost every night!. It never gets old! But I have never seen parmesan seasoning before – awesome!!! Oh go get it and let me know what you think!!! Fortunately or unfortunately I have to report all my food to my coach every day. This accountability is a fabulous and horrible thing all at the same time. hah! 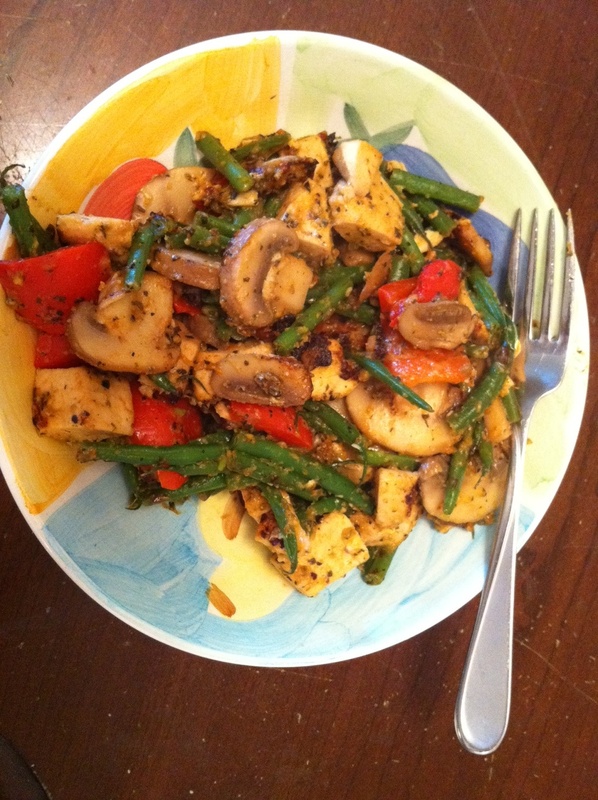 I have learned to like mushrooms because they add to the food and have very little caloric impact! I just tell myself its chicken. hah! I have also learned to like those little fungi! That food looks great! Going to definitely try this out. I love mushrooms! I know! Mushrooms make my world go round these days!